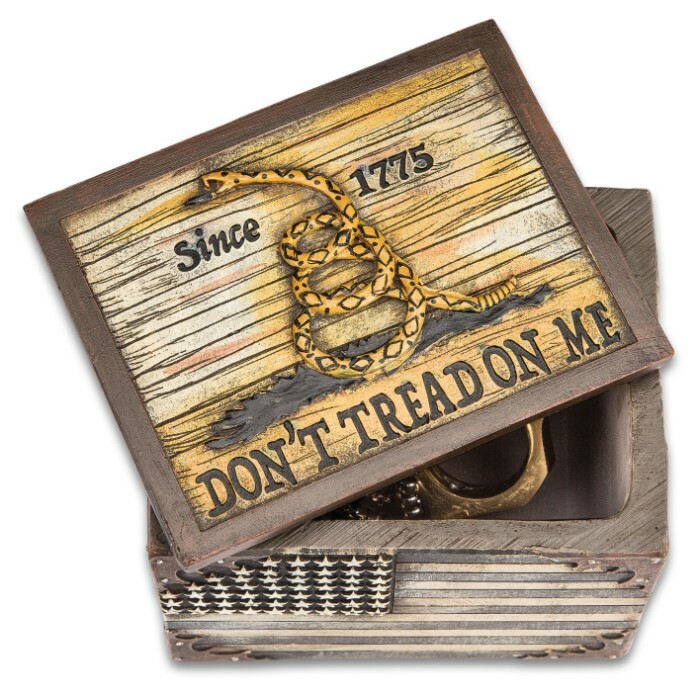 Don't Tread on Me Polyresin Trinket Box - Functional Home / Office Decor, Gift - 3D Reliefs - Gadsden Flag III 3 Percenters Patriot Independence USA America Rattlesnake 1776 Storage Stash Box Jewelry | BUDK.com - Knives & Swords At The Lowest Prices! 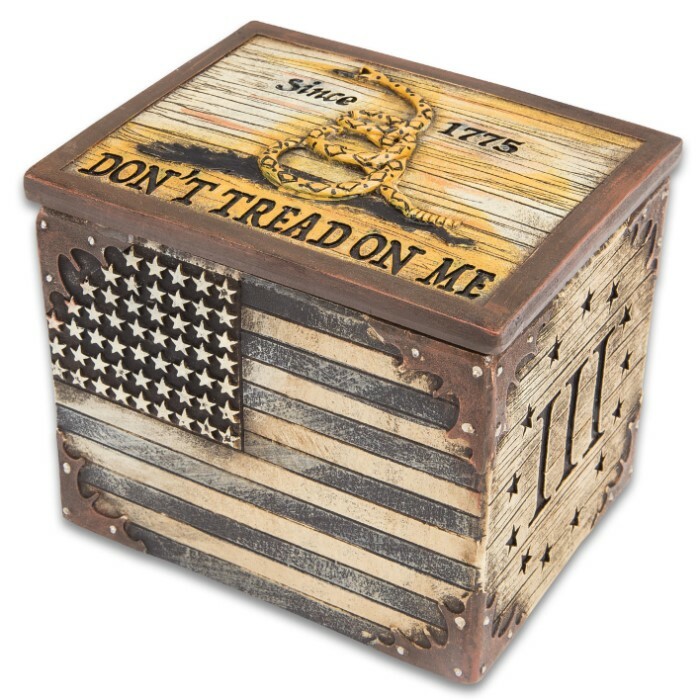 Gadsden flag on lid - classic rattlesnake motif accompanied by "Don't Tread on Me"
"Don't tread on" this cool stash box! 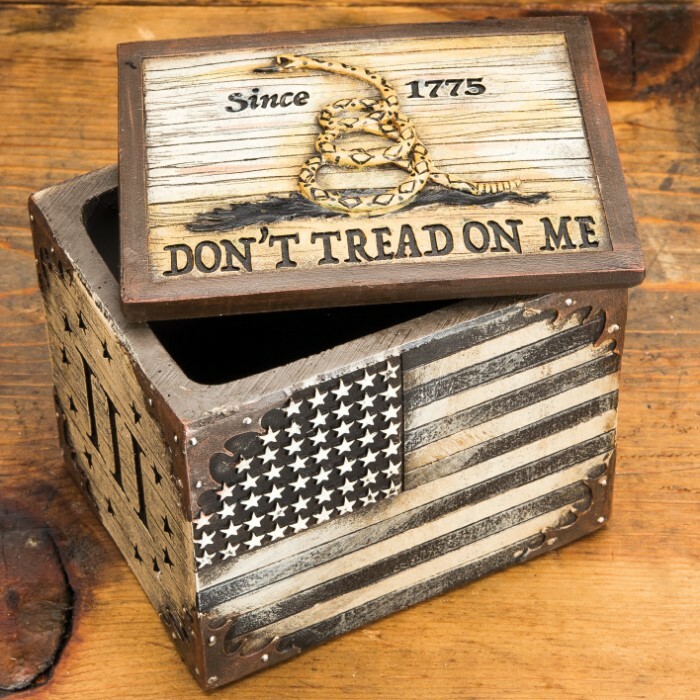 Covered with eye-catching patriot-themed reliefs, it's the perfect vessel to stow small items while also dressing up your home or office with a stylish, fiercely independent flair. Ditch your unsightly change jar and toss spare coins into this decidedly more attractive alternative. Use it to store medication, lip balm, contact lens accessories and other small bathroom staples, reducing clutter and freeing up space on your vanity. From storing nail clippers to dispensing paper clips, there's really no wrong way to enjoy this all-purpose piece of practical home / office decor! Superbly designed and flawlessly crafted, it enriches any space with rustic charm and a timeless handcrafted look. 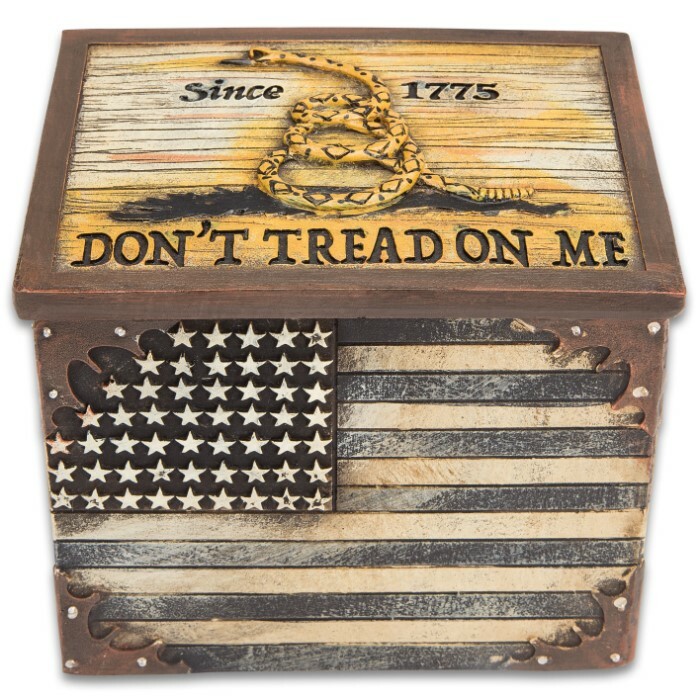 The iconic rattlesnake motif of the Gadsden flag adorns the exquisitely weathered faux wood lid, the ideal centerpiece for the box's other unapologetically patriotic art themes. The raised designs are bathed in a rich, warm patina, imparting realistic age and chic wear. The box is made of advanced polyresin, which is waterproof and more resilient than wood and most other traditional materials. It makes an extraordinary gift for any occasion, so get two - one for yourself and one for a friend or family member. 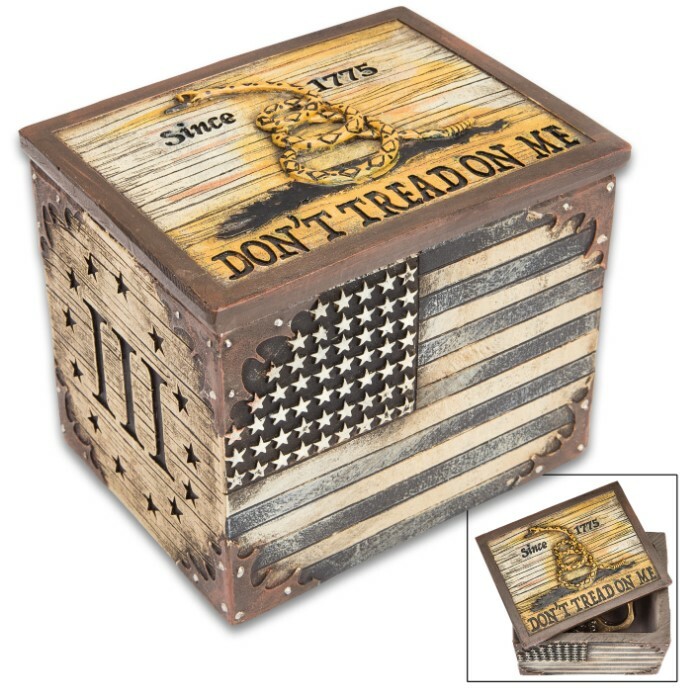 With our unbeatable prices on fine home decor and gifts like this, you practically can't afford not to!